Legacy Stoneworks provides a range of stonework services from residential architectural stonework installation to construction of stone fireplaces or architectural stonework project consulting. So whether you need granite stone supply, installation of natural stone veneers or if you are looking to construct a backyard patio or other hardscape at home, Legacy Stoneworks has the material, manpower, equipment, and expertise to provide the very best in custom stonework. Legacy Stoneworks currently specializes in stonework consulting rather than the actual stonework installations or maonry installation. Working closely with architects, homeowners, builders and masons our staff helps make a project the most beautiful it can possibly be. 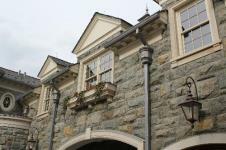 This consulting service is supported by our past years of experience doing premier architectural stonework installations Some years ago, Legacy Stoneworks installed our own Hillburn Hudson Valley Granite veneers. in the most aesthetically pleasing and architecturally sensitive manner. 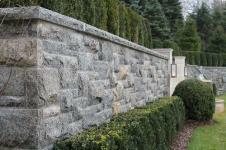 Our veneer and architectural stonework gave each project a truly custom and hand-crafted look. 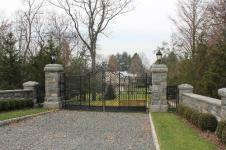 We create piers for stone walls, driveway entrances, around pools, patios or to hold fence-work. Fabrication of dimensional stone for pier caps and capstones to go along with piers is our passion. Free-standing or landscape retaining walls. Walls to host wroght iron, aluminum or wood fence-work. Legacy has experience building retaining walls around water features, pools, patios and on property lines. We construct both dry and wet walls as necessary. Walls can be natural tops or finished with wall coping stone. On the interior or exterior of your home, customized stone fireplaces and chimneys with varying stone types to create a unique and rare fireplace and chimney. We custom fabricate chimney tops, mantel pieces, lintel stones and fireplace surrounds. 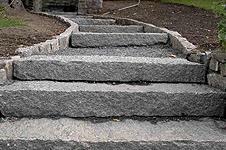 Stone stairways, walkways, pathways and patios that are freestanding or adjacent to a structure. We work mainly in granite but also in blue stone. Our work comes complete with retaining walls and foundations as necessary. Our stone stairways and walkways can be constructed with walls and piers on the edges for safety or aesthetic purposes. Legacy has the experience to consult with homebuilders, architects and homeowners on major stone projects. 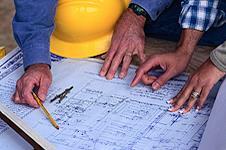 We provide on-site consultations, and ongoing project consulting and project management services. 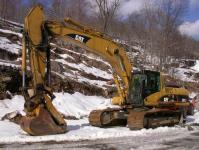 Legacy has the machinery and know-how to excavate sites for stone removal, drainage and other construction purposes.